How to fill JEE Main 2019 application form at https://jeemain.nic.in, JEE Main registration to be started/ JEE Main 2019 registration, know how to fill application form at jeemain.nic.in: The registration process for Joint Entrance Exam (JEE) to be started from February 8 (September 1 for January Exam). Candidates who wish to appear for the exam can apply for the same from the official website of JEE main (https://jeemain.nic.in/). The last date to submit the form is on March 7 (September 30 for January Exam). NTA, exam conducting body, has already released the eligibility, syllabus and other details regarding the entrance examination. NTA will start the registration process for the Joint Entrance Examination (JEE) on www.jeemain.nic.in. The engineering entrance examination is conducted for admission to various engineering colleges like IITs, NITs, IIITs and GFTIs. In 2013, the Union Human Resource Development Ministry introduced JEE-Main and JEE-Advanced in place of AIEEE and IIT-JEE which were two separate exams earlier. There was no link between the performance of student in these two exams. JEE Main 2019 April Exam application forms from February 8: NTA would be opening the online application for JEE Main 2019 Exam II or April Examination on February 8, 2019. National Testing Agency, NTA has released the JEE Main 2019 Jan Scores in record time. As many as 8.7 lakh students had appeared for the JEE Main 2019 January examination. NTA would conduct the JEE Main 2019 April examination next. Online application forms for JEE Main 2019 April examination would commence on jeemain.nic.in from February 8, 2019. Important dates are provided below. However, a question that is bothering students now is whether or not to appear for the JEE Main 2019 April examination. While it may appear that there is no flip side to appearing for the April examination again for students who are placed in the 90 percentile and above bracket, that may not be the real case. Students have to carefully examine their score and assess their performance. Remember that the candidates would qualify for the JEE Advanced 2019 based on their JEE Main 2019 Rank. A few things to consider before you decide. In case two candidates tally in all the above parameters, same JEE Main 2019 rank would be allotted to the students. To decide hence, it would be prudent to assess the raw score from the answer keys that you have scored in the examination and assess if you can improve that score. JEE Main 2019 April or second attempt applications would open next month. Experts suggest that the students who have scored a raw score of about 250 and above and are ranking above 85 percentile may not worry about appearing for the exam in April. Joint Entrance Examination (JEE) MAIN will be conducted by the NTA from 2019 onwards. JEE Main is applicable for admission to NITs, IIITs and CFTIs participating though Central Seat Allocation Board subject to the condition that the candidate should have secured at least 75% marks in the 12th class examination, or be in the top 20 percentile in the 12th class examination conducted by the respective Boards. For SC/ST candidates the qualifying marks would be 65% in the 12thclass examination. Subject combinations required in the qualifying examination for admission to B.E./B.Tech. & B. Arch./B. Planning Courses in NITs, IIITs, and other CFTIs is as under:- Required Criteria based on Class 12th / Equivalent qualifying Examination. a. B.E/B.TECH Course: Passed 10+2 examination with Physics and Mathematics as compulsory subjects along with one of the Chemistry/Biotechnology/Biology/ Technical Vocational subject. b. B.ARCH./B.PLANNING Course: Passed 10+2 examination with Mathematics. The candidate must have been born on or after October 1, 1993. Candidates interested in applying need to be intermediate or class 12 pass from a recognized board and must have appeared and qualified in class 12th examination in 2017 or 2018 or should appear in the class 12 examination in 2018. Joint Entrance Examination, JEE Main 2019 January registrations are set to close from now on September 1 and JEE Main 2019 April registrations are set to close from now on February 8, 2019. Candidates who are aspiring to get admission in an engineering college or hope to apply for JEE Advanced 2019 for IIT admissions are required to fill the JEE Main 2019 forms. This is a gentle reminder to all the engineering aspirants that there may not be an extension to fill the form. Hence, students interested are advised to fill the online application forms for JEE Main 2019 on the official website "https://jeemain.nic.in/webinfo/Public/Home.aspx". Students are advised to carefully go through the information bulletin before filling the application forms. The Aadhaar Card has been made mandatory for JEE Main examinations. Candidates who do not have the id card can apply and provide the UID registration number to fill the forms. The students from outside of India are, however, not required to provide aadhaar number while filling the application forms. Aadhaar card: Since last year, the Aadhaar card has been made mandatory. The applicants who have enrolled for Aadhaar and have not received their card should enter 14 digits Aadhaar Enrolment No. with slash (‘/’) printed on the Aadhaar enrolment slip at the time of filling the online application form for JEE(Main) 2019. The application process is completely online and this time, no hard copies of the application forms will be accepted. The exam fee ranges from Rs 1,000 for general category boys to Rs 250 for reserved category girls. The pen-paper (offline) exam will be held from April 6 to April 20, 2019 in the computer-based (online) exam for JEE Main April 2019 Exam. Step 8: The candidate, who has opted for Computer Based Examination of Paper 1, should select the date/slot after payment of Examination Fee. But from 2013, an IIT aspirant has to write JEE-Main and need to be in top 2,20,000 students (in 2013 it was 1,50,000 students) to qualify to appear for JEE-Advanced. Selection process of IITs purely depend on the performance of JEE-Advanced. The selection process for NITs used to depend on JEE-Main score along with normalised class 12 score till 2016 but from 2017, the selection process of NITs purely depend on JEE-Main score only. Though there is no direct weightage in class 12 marks in selection of either IITs or NITs, student has to score minimum of 75 per cent in board exam to join in one of these. The exam pattern remains same for the JEE-Main. The duration of the exam is for three hours and the questions are from mathematics, physics and chemistry based on class 11 and class 12 syllabus of CBSE. Joint Entrance Examination, JEE Main 2019 registrations to be started on the official website https://nta.ac.in/Engineeringexam. Aspirants can apply online on the official website. 1. Aadhaar Card has been made compulsory for the JEE Main 2019 registration. 2. Candidates who are writing the JEE Main 2019 with the aim of writing the JEE Advanced 2019 must also read the revised eligibility criteria for JEE Advanced. Please note, while the number of attempts allowed in JEE Main 2019 is three, the limit of attempts for JEE Advanced is capped at 2. Hence, students are advised to check the new eligibility criteria provided in the link above before filling the form. 3. Please make sure you are filling the correct online application form. 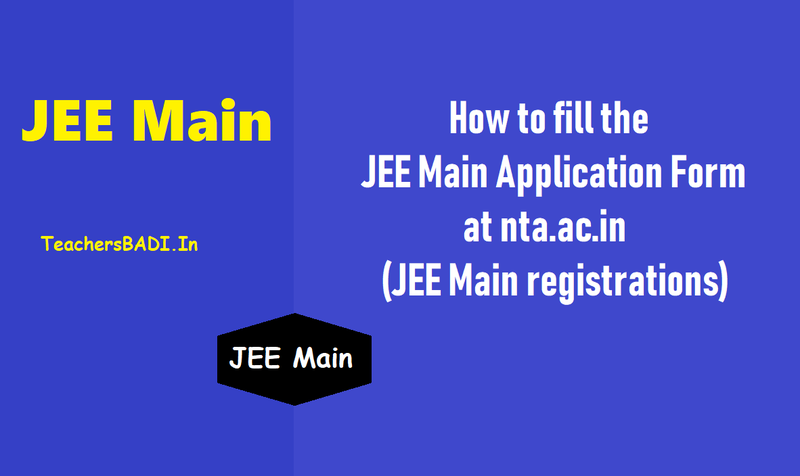 The official website for JEE Main 2019 is https://nta.ac.in/Engineeringexam. Candidates are advised to copy the link in a window and go to the official website. 4. Please note, it is advised to fill the online application forms from a desktop or a laptop pc. Avoid filling the forms on the mobile devices or i-pads. 5. Candidates would be required to upload their picture and signature on the website. The picture must be in a proper format as specified in the instructions given in the JEE Main 2019 information bulletin. Also, parents would also have to upload their signature to the form. The size and specification of the uploads is also provided below. 6. Candidates are also requested to be very careful while filling the details. While candidates may be allowed to make minor corrections in the image upload, there is no guarantee NTA would open an edit window. Also, personal information cannot be changed once registered. Candidature registered more than once on the same id would be summarily rejected. 7. Aspirants are also advised to carefully go through the list of centers available. Please note, pen and paper mode is not available from this year. All aspirants are requested to carefully go through the center list before filling the options. The facility to change the center once applied for, would not be provided to the candidates.